Eating right while eating out can be a challenge. But, it is possible. A chef from Tommy Bahama joined us in studio to talk about what they offer, as well as what to look for on menus as you're out on the town. Eating right while eating out can be a challenge. But, it is possible. 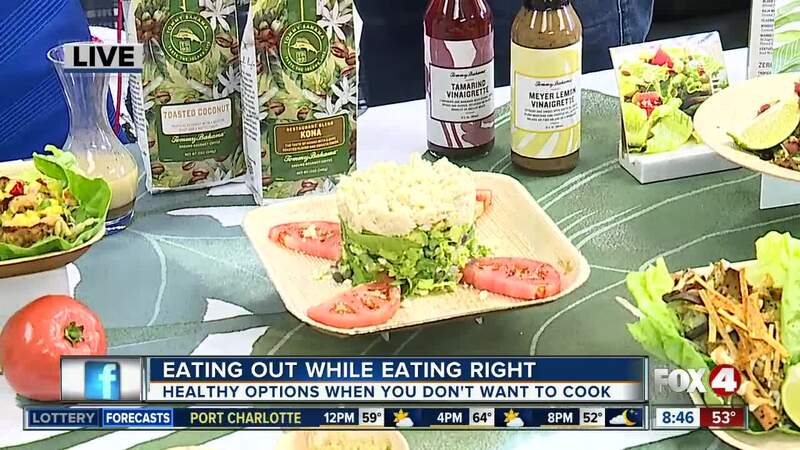 A chef from Tommy Bahama joined us in studio to talk about what they offer, as well as what to look for on menus as you're out on the town. Bypass the Bread – Instead of sandwiches, opt for a protein bowl. Start with a base of whole grains like quinoa and farro, add on fish, shrimp or vegtable, some greens and you have a healthy meal with a variety of texture and flavor. Wrap it in Lettuce – Eat your tacos wrapped in lettuce instead of traditional corn or flour tortillias. It’s crisp and refreshing and cuts down on calories. Smart Salads – Cesar salad is appealing, but doesn’t pack the nutritional punch of other salads like Tommy Bahama’s Grilled Chicken Mango Salad or Char Grilled Filet Mignon Salad. Loaded with lettuce and vegetables and topped with chicken or steak , these salads offer a great balance of protein and flavor. The Grilled Portobello Mushroom Salad is a great option for vegetarians or vegans. Pizza Lover? – Skip the sauce and cheese and try one of Tommy Bahama’s flatbreads instead! The thin flat crust is a topped with Filet Mignon, BBQ chicken and plenty of flavor to satisfy your pizza craving! The mushroom flatbread is also a great choice if your looking for vegetarian or vegan options. Skip the Soda… and the Juice – Soda and juice are loaded with sugar and empty calories. Naturally infused water with fresh lemon, lime, orange or mint is a way to get your recommended 64 ounces of water per day that and has more flavor than plain water.